My art-room / spare bedroom has been a chick brooder since January of this year. The weather is warmer and I’ve decided I’ve had enough – my smallest chicks (one month old) have most of their feathers, and it’s been getting warmer lately. I wouldn’t be in such a rush but the escape artist has taught the others to escape – I’ve changed them to 3 different brooder boxes, each one taller, and they keep getting out and pooping everywhere. I’ve been thinking about ways to get them outside permanently. I’ve had my older chicks (2.5 months old) outside for about a month, but separated from my adult chickens. They could see and hear each other, but not interact. We decided to try to integrate them, in order to bring the smaller chicks outside – I planned on putting the big chicks with the adults, and then putting the babies in the separate part that the older chicks had been in. I’ve heard to try to do it at bedtime, so they don’t really realize what’s going on, in order to keep the transition smoother. We did not do this for some reason. A few hours before I put them in for the night, we put the six 2.5 month olds in with the ten adults. They are very nearly the same size. It was a mess. My poor chicks were traumatized. I figured my rooster would be the main culprit, but my hens were really mean. I know that they need to work out their pecking order, and it can take some time. First it was like two cliques – adult birds on one end of the run, the chicks on the other. Then somehow a couple chicks got separated and my hens started chasing them and trying to mount them, I guess. Then the chicks were in two groups of three. I went inside for a few minutes to let them work it out. I came back out and heard loud squawking. I found one of the chicks cowering in a corner of the run, trying to get back into their old run. 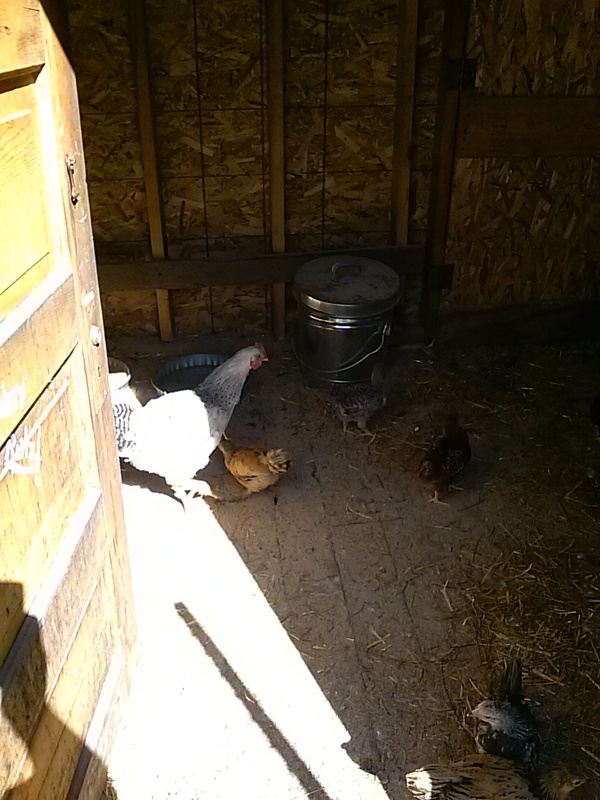 It ended up with the chicks hiding inside a corner of the coop, and all the adults hanging out in the run. I was going to just let them sort it out, but I felt really bad. My chicks were really scared – one even kept losing feathers – I don’t know if it was from stress or from being pecked by the hens. I figured we will have to integrate them eventually, and they’ll work it out. It seemed to go a lot better. The 2.5 month olds are quite a bit bigger than the 1 month old chicks, and they have been picking on them a bit, but they’re not obsessed with them like the adults seemed to be with the older chicks. If the small chicks stay away from the older ones, they don’t get pecked at all. The small chicks don’t seem too stressed, anyway. My big chicks and large chicks together. I had a couple of issues when putting them in for the night though – first, the little chicks had no idea what was going on. 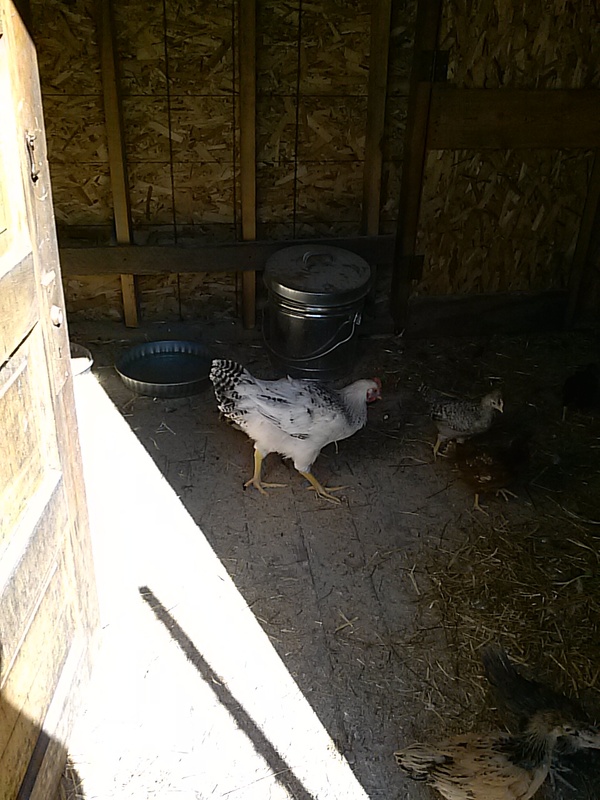 I have to get them trained to go in at night (usually I clap and follow the chickens in, the older ones have learned this pretty well) – so they didn’t go into the coop on their own when I did this. I picked them up, put them inside, and then a couple of them ran outside but their run was open so they ran into the yard. I had to catch them – that wasn’t too hard. My biggest issue when putting them to bed was that the older chicks were hanging out right under the heat lamp, which was in the corner of the coop. The baby chicks found a nice spot on a pile of hay that they liked, since it was far away from the older chicks, but that wasn’t close to the heat lamp, and I worry about it getting cold at night if they can’t access the lamp. My husband was smart and just moved the heat lamp to the middle of the room for me – so that problem got solved. I also gave the babies some straw to go on their hay pile, because hay is NOT very soft, at least compared to straw. I put the water and food a bit more in the middle, so that the babies wouldn’t have to go too near to the older chicks to eat or drink, and risk getting picked on. We checked on them through the night before we went to bed, and they were doing ok. The babies are now doing good. The larger chicks are hiding out in the coop, but the food and water are in there, so they will be ok if they decide not to go outside today with the adults. Like I said, they are almost adult sized, so they should be a lot better able to defend themselves against the adults, than the tiny chicks are with them. They’ll just have to work it out on their own. I didn’t realize it would be this much of a mess to integrate them all. Next Article Doing what needs to be done.